High Fiber Foods that Feel Like Cheating. I know that there are some people who don’t like avocados. But they’re just wrong. They’re missing out on buttery mouthfeel with the fiber content of shredded wheat. One avocado contains 13 grams of fiber. It’s almost absurd, and it certainly feels like cheating. But since it’s a reality, why not take advantage with some yummy avocado quesadillas? Wanna know some other foods that feel like cheating? 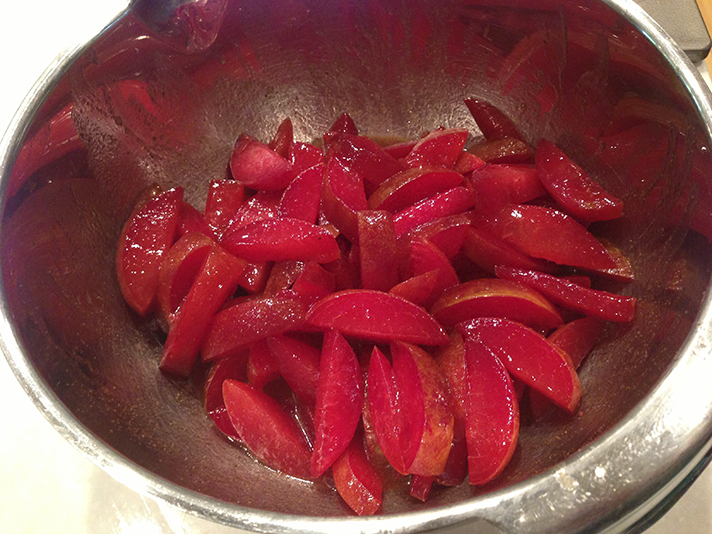 All the stone fruits (not just the plums — peaches, nectarines, apricots and cherries too) rock out in the fiber department, so for our high fiber meal for cheaters, I’m calling them in too with a lovely and delicious pluot salad. And don’t forget the beans. From split peas and lentils to black eyed peas, beans pack a fibrous punch. So I’m working the black bean angle and adding some tasty beet greens (not so shabby in the fiber department themselves) for color and a cruciferous crunch. It’s always worth looking into the fiber content of your foods. Artichoke hearts, peas, edamame, raspberries … plenty of my favorites are high in fiber, and knowing which ones are shining fiber-filled stars may sway you to make different, more healthful choices when planning your meals each week. Go ahead, make your colon (and Katie Couric) proud. Fiber up! 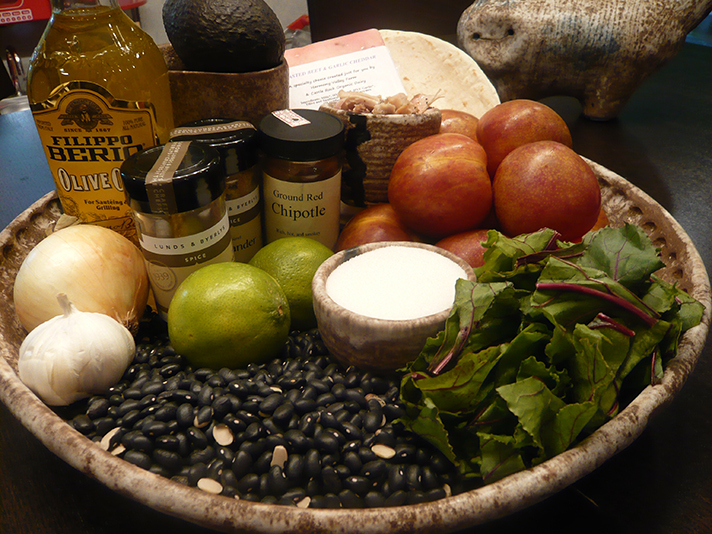 Gather your ingredients. Preheat a large griddle for 5 minutes over medium heat. If you have to use a sauté pan and work in batches, I’d preheat the oven to 200 and put a sheet pan in there so you can keep the finished quesadillas warm while you cook off the rest. Meanwhile, assemble the quesadillas. I used beet cheddar from our crop share, because I had it lying around the fridge, but also because it plays nice with the beet greens I used for the beans. I used pulled chicken from some bone-in, skin-on thighs I’d cooked the night before (because, yum), but you can use whatever kind of chicken you’d like, including leftover rotisserie chicken or sliced deli chicken breast. 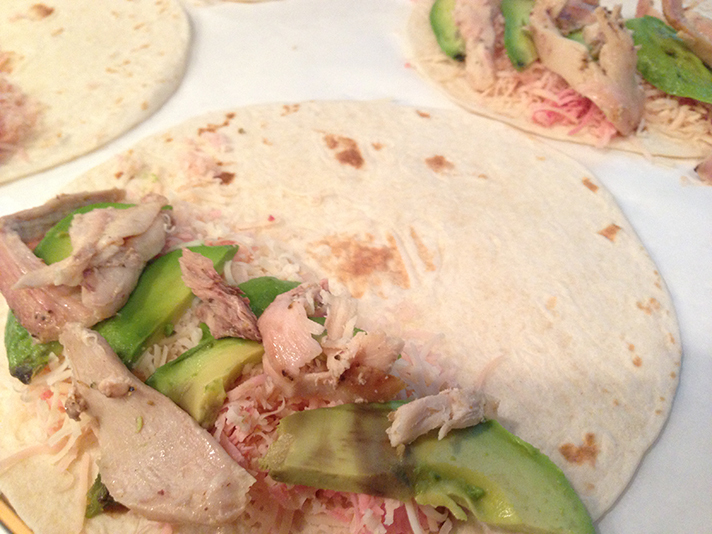 Evenly divide the cheese, avocado slices and chicken between the 8 tortillas. Season to taste. Leave half the tortilla empty so you can fold it over. You can also stack two tortillas, covering the bottom one entirely in the filling, but I find the tortillas stay together much better if you fold them instead. Use less filling than you think you need. This is true of anything you fold, stuff or enclose, from empanadas to ravioli. People almost always use too much filling, and whilst it’s tempting to turn every food into an American cornucopia of overstuffed deliciousness, it mostly makes the food difficult to eat, or worse, causes the wrapper to burst. Boo. Once the griddle is hot and the quesadillas are assembled, cook ‘em up. While I use a profane amount of butter on the griddle when making grilled cheeses and pancakes, I like to cook quesadillas on a dry griddle. Cook for 2-3 minutes on the first side, then flip, preferably using a fish spatula and continue to cook on the second side until the filling is hot and the cheese is melted, usually about 2-3 minutes more. 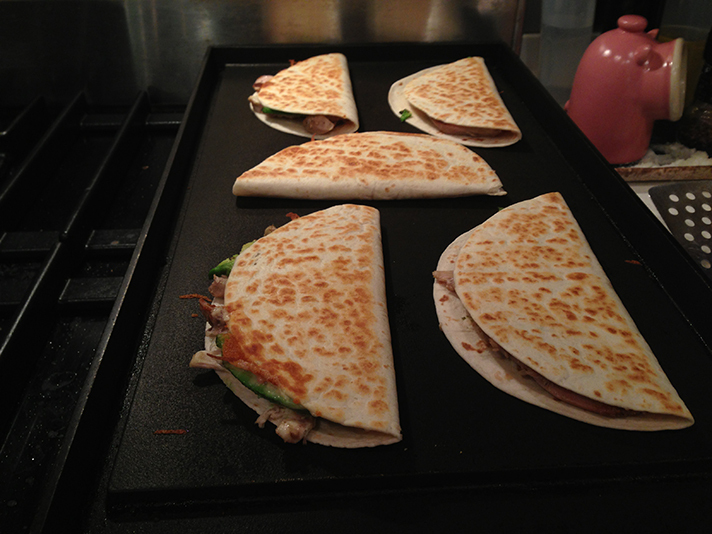 Let the quesadillas cool slightly, then cut each into quarters. If you’re a fan of salsa and sour cream, by all means, pile those on too. Either soak the dried beans in the fridge overnight in a large container with an ample amount of water; or, use the quick-soak method. 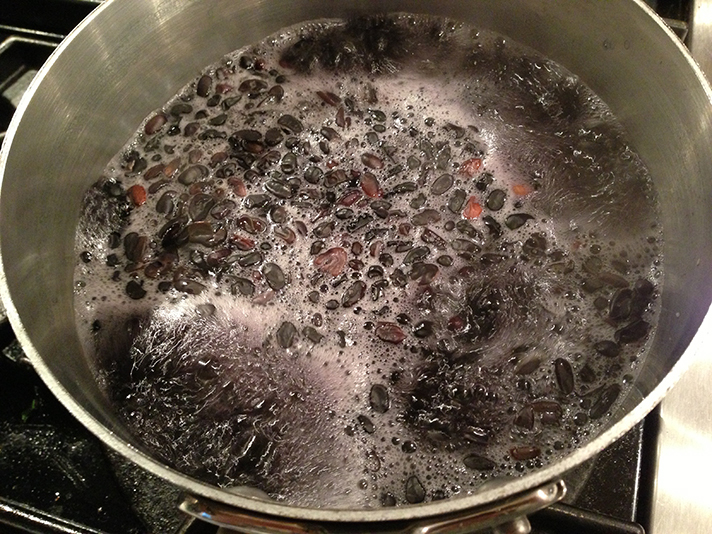 To quick-soak the beans, cover them with about two inches of water in a large saucepan and bring to a boil. Skim off whatever scum or foam rises to the top, then stir, boil 2 minutes, cover and turn off the heat. 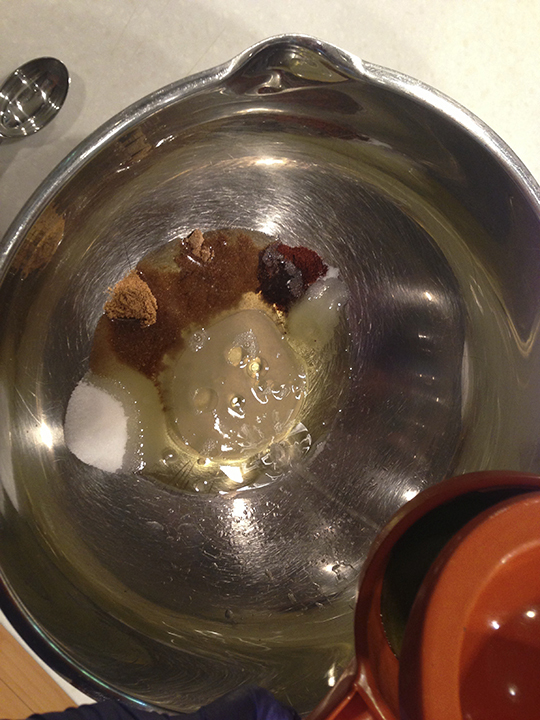 Allow beans to soak 1 hour, then proceed as if you’d soaked in cold water overnight. The quick-soaked beans won’t look as plump and presentable as their cold-soaked counterparts, but their flavor won’t suffer a bit. If both of these options sound too dramatic and time-consuming, you can sub 3 cans of rinsed black beans. Drain off most of the soaking water, then add the onion, garlic, olive oil and salt, plus enough fresh water to cover by two inches. Bring to a boil, then reduce heat to low and simmer uncovered for 60-90 minutes, stirring occasionally, until beans are fully cooked but not mushy. Stir in your greens. 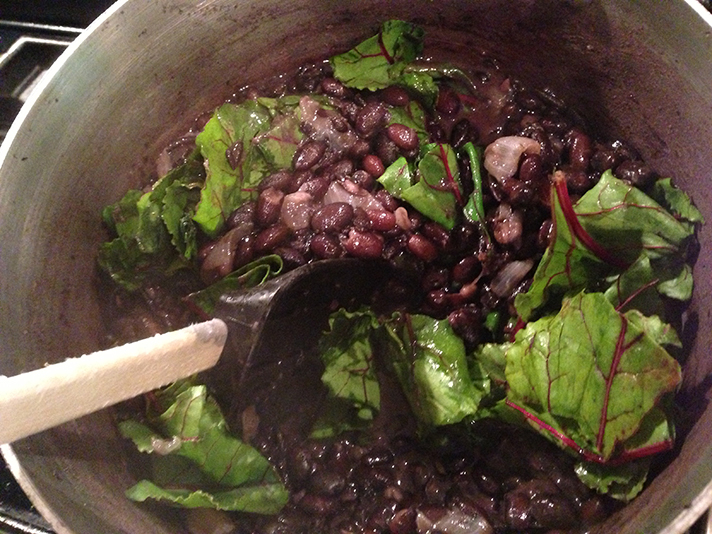 For this recipe, I used beet greens, because I had them. Don’t throw away beet greens if they still look nice and fresh. They are hands-down one of the most nutritious foods you can eat, so don’t waste them just because they’re not rainbow chard. They’re basically the same thing and they come free with most beet purchases. Hooray! Anyway, after adding the greens, keep simmering until the greens are wilted, then taste for seasoning. 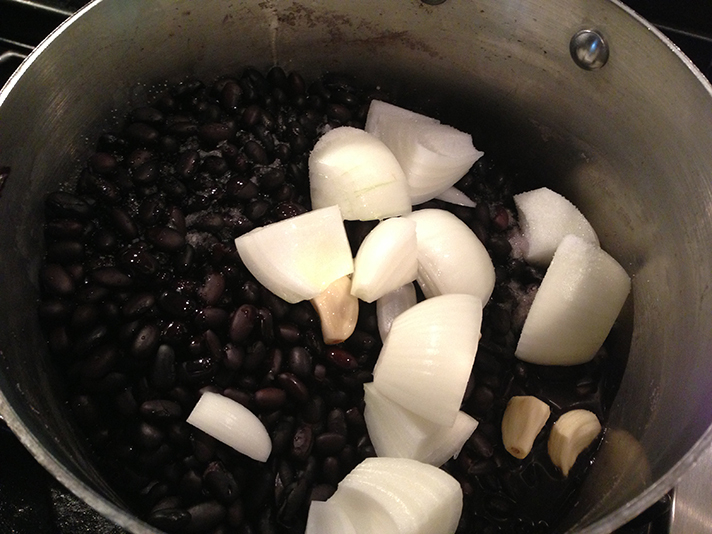 Add salt and pepper as desired, and perhaps even a little lime juice or apple cider vinegar if the beans seem a little “flat.” Acid dissipates with heat, so if you add acid at the beginning of cooking, you’ll probably have to add more at the end to get the flavor profile back where you want it. So don’t think you could just add a little vinegar with all the rest of the ingredients when you first get simmering — that won’t work. 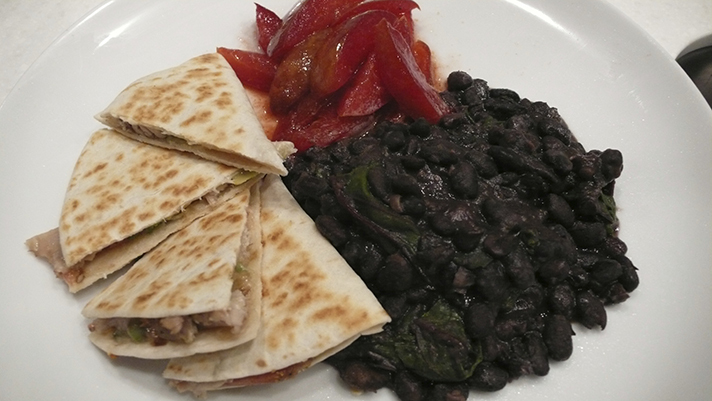 Okay, enough about that, serve the beans with the quesadillas and pluot salad, and enjoy! Just catching up on the blog. Great work so far…and it is going to be super fun to see where you take it. Also, to guess what you will post about based on what you send for lunch for the kiddos. I seem to remember this entire menu just a couple of weeks ago!!! Thanks, Kerry! And yes, it’s true. You will probably figure out what’s coming before anyone else!